Many of us have been living with musty, moldy smells in the basement, garages, or other lower level rooms. Not only are these odors unpleasant, they are a sign of excess moisture and humidity in those rooms. The result of this moisture can cause clothing, carpets, or fabrics to grow mold or have musty smells when stored in these areas. Personally, I know that I have a musty basement and wet gym clothing or hockey equipment will fail to dry out and the result is musty, smelly clothing that is hard to clean. This is not a pleasant situation. Spring, summer, and fall are the worst times of the year for these musty smells because the Pittsburgh air is more humid and rainfalls are frequent. Once winter rolls in, these musty odors can often be eliminated, but why live with them any time of the year with there is a simple remedy? 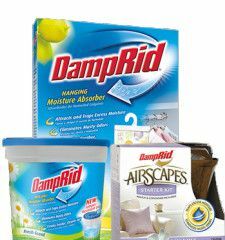 This remedy is DampRid moisture absorbers! They are available for rooms as small as a closet and as large as a huge basement and they are super simple to use. Simply pour the granules into the top of the canister and place in the problem area. Moisture is slowly attracted to the canisters and is collected at the bottom. Replace them every 1-2 months and you are good to go! If you have a worse situation, and one that DampRid moisture absorbers can not take care of, then you will want to purchase a dehumidifier. These devices will continuous collect excess water from the air and reduce the humidity in the room. They turn off automatically when full, but if you are able to drain them to a floor drain, then you can let them run continuously during the problem months of the year.